A beautiful Full Integral Big-Bear by Ricardo Velarde. This knife has amazing Mammoth Tooth Ivory and gold pins. 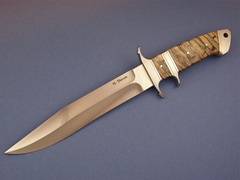 Ricardo is one of the best in the World making Full Integral Knives.